Sorry this is a really poor photo but it was quick and light was fading fast and I had to post it off to make the Birthday in time. 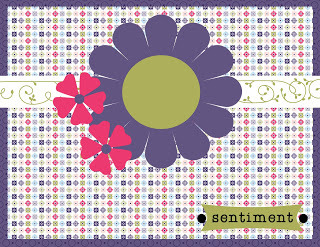 I have used Cupcake collections from Papertrey Ink and the sentiment is from the Sweet As Can Be set also from PTI. A day full of crafting today so maybe back with more. Tammy this is super sweet & too cute! I love this card!!! What a great take on the sketch. Thank you for playing along with us at Try Stampin' on Tuesday. Lovely card and that cupcake looks yummy! Great take on the sketch and I really like the washi tape in the center of the card. Thanks for sharing it with us at Try Stampin on Tuesday. What a great card. Love your 'frosting' on the cup cake. Thanks for playing along at TSOT.